Morgellons disease is a rare, little-known disorder which is characterized by the emergence of small fibers or other particles from skin sores. Morgellons disease is often considered to be a delusional disease in which the affected individuals typically feel that parasites or foreign materials are moving in the skin or coming out of it, thereby resulting in a crawling or stinging sensation. The disease can lead to depression, and can severely interfere with the quality of life of affected individuals. Morgellons disease is also referred to as ‘fiber disease,’ and is mostly associated with non-specific skin, nerve, and psychiatric symptoms. It is a non-contagious condition because there is, so far, no indication that the disease is caused by an infection. 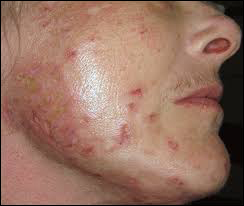 People affected by Morgellons disease appear to be at a greater potential risk of developing Hypothyroidism (low thyroid functioning). The condition can affected people in any age group, though it is more likely to affect females aged between 35 and 50 years. In addition, reports have also revealed that Morgellons disease can apparently affect patients suffering from Lyme disease. There is no specific treatment for Morgellons disease. However, individuals suffering from this uncommon condition generally benefit from the use of medications which comprise the treatment for treat psychosis or tics. In some cases, doctors who believe this condition to be a delusional infestation usually try to treat it with cognitive behavioral therapy and counselling, along with antipsychotic drugs antidepressants. To prepare these tablets, Shuddh Gandhak (Purified Sulphur) is combined with some beneficial natural ingredients which include: Guduchi (Tinospora cordifolia), Cinnamon (Cinnamomum zeylanicum), Haritaki (Terminalia chebula), Amalaki (Emblica officinalis), Vibhitaki (Terminalia bellerica), Patra (Cinnamomum tamala), Nagakeshara (Mesua ferrea), Shunti (Zingiber officinalis), Bhringaraja (Eclipta alba), Ela (Elettaria cardamomum), Godugdha (Cow milk), and Sita (Sugar Syrup). The natural components of these tablets are known for their antiviral, antibacterial, anti-inflammatory and antimicrobial actions. Patients suffering from Morgellons disease can benefit from these tablets because of their ability to relieve skin itchiness, treat chronic fever, relieve burning sensation on skin, treat fungal infections, purify the blood, and balance the body’s Vata, Pitta and Kapha doshas. Dosage: 2 tablets two times a day, after meals. For preparing these tablets, some potent herbs are used, including Amalaki (Emblica officinalis), Haritaki (Terminalia chebula), Bibhitaki (Terminalia bellirica), Ginger (Zingiber officinale), Guggulu Resin (Commiphora mukul), Guduchi (Tinospora cordifolia), Pippali (Piper longum), Black pepper (Piper nigrum), Vidanga (Embelia ribes), Red physic nut (Baliospermum montanum), and Indian jaap (Ipomoea turpethum). The use of these tablets is beneficial in Morgellons disease because the natural ingredients of the tablets can treat skin disorders, manage hair conditions, eliminate toxins from the blood, reduce pain and inflammation, purify the blood, maintain healthy skin, and support the overall health of all organs of the body. Dosage: 2 tablets with plain water, two times a day, after meals. This excellent formulation for relieving the symptoms of Morgellons disease is prepared from a combination of well-known herbs which include Manjistha (Rubia cordifolia), Pit papda (Fumaria officianalis), Grit kumari (Aloe barbadensis), and Chirata (Swertia chiretta). The natural ingredients of these capsules have the ability to support healthy skin and body. The use of these capsules can make the skin firm, smooth and elastic, and also treat pimples, acne, ringworm, and psoriasis. Dosage: 1-2 capsules two times a day. For preparing these capsules, some extremely beneficial natural ingredients are combined, including Praval Pishti (Coral Calcium), Mukta Pishti (Pearl Calcium), Akik Pishti (Agate Calcium), Jawar Mohra Pishti (an Ayurvedic Calcium compound), Giloy satva (extract of Tinospora cordifolia), and Kamdhudha Ras (an Ayurvedic Calcium compound). The components of these capsules have proven capabilities to manage a number of health conditions including Morgellons disease. The capsules are specifically helpful in balancing the Pitta dosha of the body, keeping the skin healthy, boosting the immune system, purifying the blood, and treating ulcers and several other conditions. Dosage: 1-2 capsules with plain water, once or twice a day. The application of this amazing gel, prepared from beneficial natural ingredients, is an excellent herbal remedy for managing several skin conditions, including dry skin, itchy skin, rough skin, and skin acne. The use of this product can keep the skin healthy and moisturized, improve skin texture, maintain pH level of the skin, treat tanned skin, and keep the skin hydrated, smooth, soft and shiny. Method of Application: Squeeze a small amount of the gel onto a wet body sponge or pouf, work into a creamy lather on the skin, and rinse the skin clean. The application of Nirgundi oil mixed with Neem oil can also bring relief to the patients of Morgellons disease. Nirgundi oil is prepared from the ‘Nirgundi’ herb (Vitex negundo) which is known for its antioxidant, anticonvulsant, and hepatoprotective properties. The herb has the ability to manage various skin problems and reduce inflammation. Neem oil, on the other hand, is prepared from the highly potent ‘Neem’ herb (Azadirachta Indica) which is widely known for its antiviral, antibacterial, and antifungal actions. The use of the herb can treat several skin disorders, including dermatitis, warts, acne, itching, eczema, dry skin, psoriasis, wrinkles, skin rashes, cold sores, boils, and Scabies. Method of Application: For managing Morgellons disease, Nirgundi oil mixed with Neem oil can be applied 2-3 times topically to affected skin. 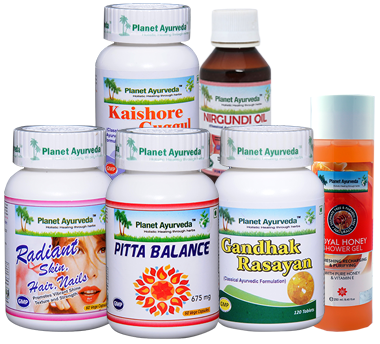 All the products offered by Planet Ayurveda for managing Morgellons disease are completely safe to use because they are 100% vegetarian formulations. These products are free from chemicals, preservatives, starch, yeast, artificial colours, binders, fillers or additives.